Leader's Clinic is a Korean clinical skincare brand that's been increasingly popular in Asia lately, in particular Hong Kong, and here in Singapore. The brand was supposedly developed by dermatological specialists in Korea utilizing their knowledge and experience in dermatology, and is fast developing a reputation for products that actually work. Their best selling items are their masks, which apparently sell 500,000 sheets a month! With such a reputation, I couldn't wait to try it - after all, nothing is better worth your money than skincare that actually delivers. And so, I began my foray into Leader's Clinic with the Leader's Clinic Collagen Infusion Mask. This is a sheet mask, and comes in a very neat-looking white-and-yellow foil packaging. It's meant to deliver moisture to the skin, and leave the skin more hydrated. 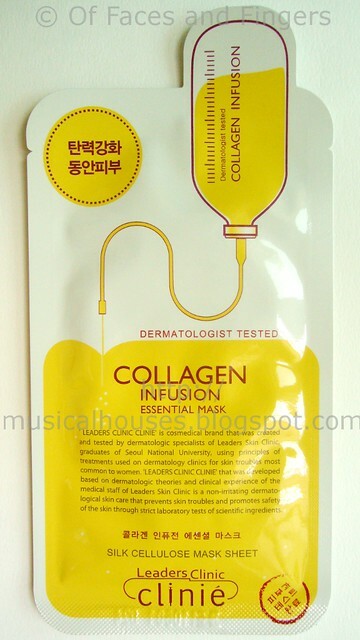 I really like the little illustration of a bottle of collagen being emptied out - really looks like a collagen infusion, doesn't it? The mask itself surprisingly doesn't make any fanciful claims, which I really appreciate. Usually, most products with collagen inside will tend to make all these outrageous claims about plumping up your skin from within, which isn't technically true, since collagen molecules are too big to be absorbed by the skin. So collagen can sit on top of your skin as a moisturizer, but there is no way the collagen is going to be absorbed by your skin and form part of your skin. The molecules are just too big for that. 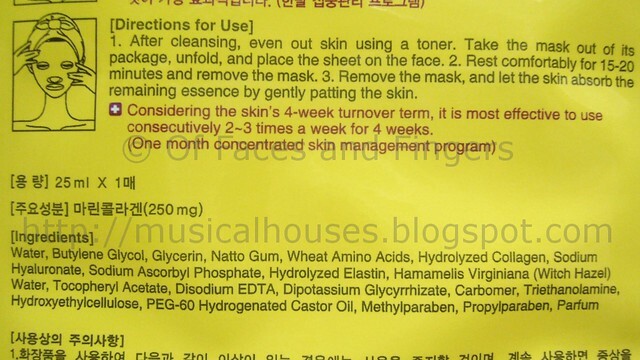 The ingredients list is also something I respect in the Collagen Infusion Mask. I can't tell you how many times I've come across products that claim to be collagen-enriched, or this-or-that-ingredient-enriched, only to find that they are listed last or next to last on the ingredients list (ahem, Biore Marshmallow Whip, I'm looking at you). The top few ingredients include glycerin, sodium hyaluronate, both of which moisturize the skin, as well as some other ingredients which may possibly help the skin. Collagen is listed near the top of the list too, which means that Leader's Clinic has actually bothered to put in a significant amount of collagen - or at least, much more than other skincare products do. When you open the mask, you get a very plump-looking silky sheet swimming in a clear liquid. The liquid has a light pleasant floral smell, and although I'd rather not have perfumes in my skincare, I do appreciate that the smell isn't overwhelming. The texture of the clear liquid is like water, but a little stickier. If applied in small amounts to the skin, it actually absorbs very fast - I'm thinking that it actually may be possible to produce a bottled serum from this liquid. 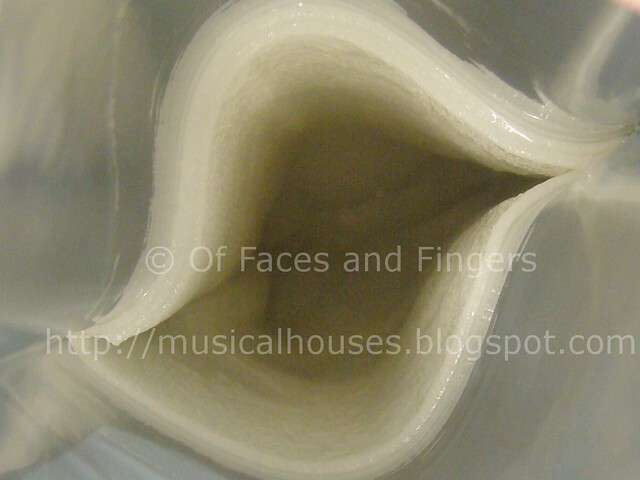 The mask material is made out of silk cellulose, which makes it thicker and stronger than paper, but otherwise, it feels and behaves like paper. The mask is also very porous, and there are tiny holes in the mask. I quite like the material, actually, it isn't as flimsy as paper, but still light. 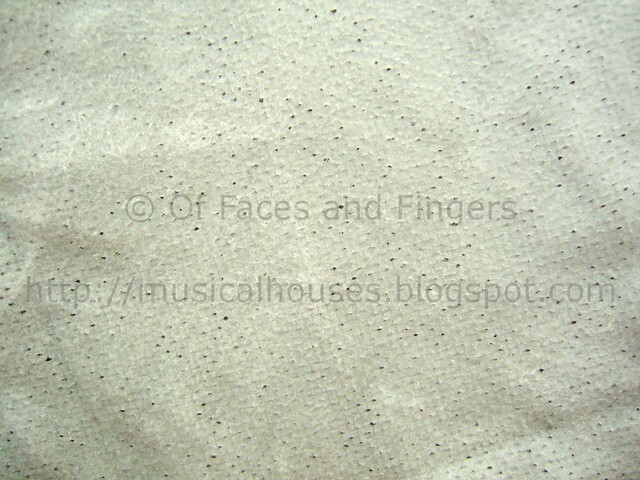 Below is a photo of the dried mask sheet, so you can see what it is like. Another thing I liked about the mask is that it fit very well on my face. I kinda have a large-ish face, so a lot of all these teeny weeny sheet masks don't fit well. But with the Leader's Clinic masks, I had very little problem with fit. I was so pleased with the fit that I just had to take a photo of myself with the mask on, just to show you guys. Pardon the pimples in the photos below - as you probably know if you're a regular blog reader, my sensitive, acne-prone skin isn't the easiest to manage! The Leader's Clinic Collagen Infusion Mask did leave my face feeling hydrated, and I think it did live up to its claims of moisturizing my skin. The liquid residue it leaves behind does have a slightly sticky feel to it, but it also did leave my skin feeling softer. I'm also pleased to report that it didn't break me out - since I have sensitive skin, some skincare products do break me out, so I was glad to find that this mask moisturized and softened my skin without any adverse effects. Also, while the mask felt cool and refreshing upon application, it didn't sting my face, which was also a good thing. So this mask will probably work on sensitive skin as well. All in all, I think this is a mask that I could definitely look forward to using again. If you want a mask that provides hydration and works well on sensitive skins, the Leader's Clinic Collagen Infusion Mask would definitely be one to check out. If you're ordering online, Leader's Clinic is available on Joypharm's Wordpress Sales Page, where she sells Leader's Clinic and other Asian brands (both makeup and skincare). She's also excellent with customer service, and also is pretty generous with freebies and samples, which is definitely a plus! Lastly, if you use the code JERLENEJP with your order, you'll get a free facial mask with every S$30 purchase on top of the usual freebies. So do check out Joypharm's site if you're interested, and I'll be bringing you more Leader's Clinic reviews soon. It fits your face like a glove! I need to catch up on my masking this month! Thanks for the review! I love the fit of their masks and the N.M.F Aquaringer Ampoule Mask is really good for hydration!